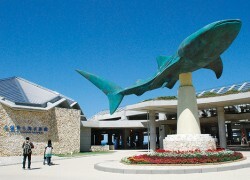 Ocean Expo Park is situated on the beautiful west coast of the Motobu Peninsula approximately 100 kilometers north of Naha (about a two-hour drive). 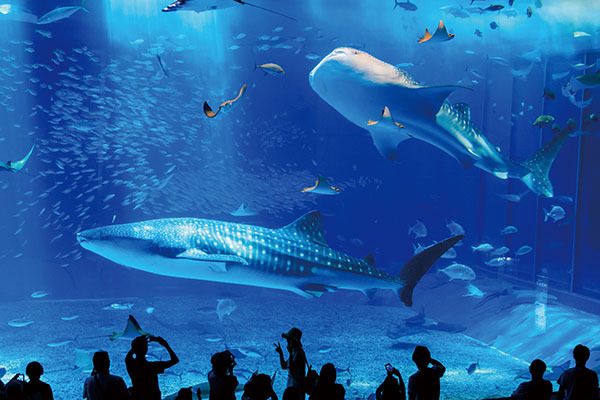 The sprawling facility features major tourist attractions such as Okinawa Churaumi Aquarium, the Tropical Dream Center, the Native Okinawan Village, the Tropical & Subtropical Arboretum and the Oceanic Culture Museum, hosting a planetarium theater with daily shows. The Sea Turtle Pool, with an underground observation room, allows visitors to watch these marine reptiles both above and below the water line, while the Manatee Pool offers a rare, up-close look at the curious aquatic mammals said to have inspired the mermaid legends of old. Also located on the premises are the Dolphin Lagoon and Oki-chan Theater, where lovable dolphins playfully show off their intelligence and athleticism for park visitors. Relax for a bit at Sunset Square or take a stroll along the beautiful Emerald Beach and Seashore Alameda, which offer an unforgettable vista of the blue sea as well as several small islands off Okinawa’s western coast. Two huge whale sharks and manta rays glide among schools of tropical fish in an enormous acrylic tank. The tank is also the scene of an unprecedented attempt to breed whale sharks in captivity, heretofore considered impossible. Should this prove successful it will no doubt mark a crucial step toward unraveling the many mysteries surrounding the life and habitat of these enormous marine creatures. 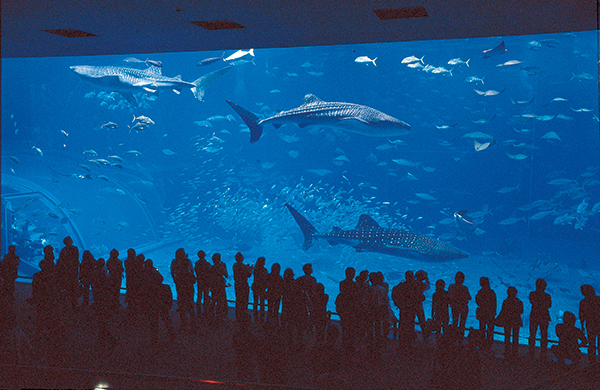 The enormous Kuroshio Sea tank can also be explored from a catwalk above. Part of the catwalk's surface is made of glass through which you can see gigantic whale sharks swimming right under your feet. No matter how many times you visit the Okinawa Churaumi Aquarium, you will always find something new, whether it's a rare marine animal you've never seen before or one of the many activities and events scheduled throughout the year. If you are planning to visit the aquarium more than once, the Annual Passport may be for you. It will pay for itself in just two visits! In addition to unlimited visits for a full year, other benefits of the Annual Passport include discounts at shops and restaurants and also free shuttle service. Fill your summer and the months to follow with exciting and educational experiences!